Through the work of Macfarlane and Knight, the α-toxin of Clostridium perfringens was the first bacterial toxin to be recognized as an enzyme. These investigators showed that a material prepared from the growth supernatant of this organism was capable of hydrolyzing lecithin (phosphatidylcholine) to give rise to phosphocholine and diacylglycerol. This lecithinase activity was inhibited by specific antitoxin (Macfarlane and Knight 1941). The importance of C. perfringens (previously C. welchii) in frequently fatal gas gangrene infections resulting from war wounds provided impetus to understanding the mechanism of gangrene pathogenesis. During the 77 years since this pioneering work, a large number of lipases and phospholipases have been identified as secreted bacterial products, and many of these are considered to be involved in pathogenesis. 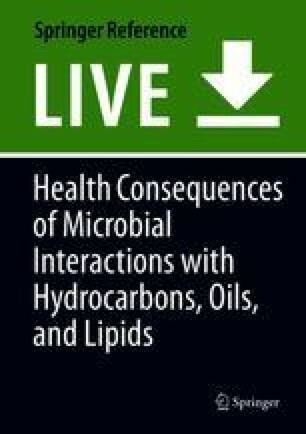 In this chapter, I will provide examples of some of the best studied members of this group, especially those for which there is considerable understanding of their role in disease. A recent thorough review provides information on the structures, activities, and importance of bacterial sphingomyelinases and phospholipases in the pathogenesis of a wide variety of bacteria (Flores-Diaz et al. 2016). Interactions of these enzymes with membranes and the physical effects produced by the products of their activity have also been thoroughly reviewed (Goni et al. 2012). Lipases are enzymes that cleave monoacyl-, diacyl-, and triacylglycerols. They cleave at the ester bond between the fatty acyl chains and the glycerol backbone. Although the cleavage is at the same bonds, they are distinct from phospholipases A and B, which are specific for phospholipids. Lipases can be specific for cleavage at a certain position on the glycerol backbone (Rezanka et al. 2017). Phospholipases are categorized according to the position of action on the phospholipid molecule. Phospholipase A1 cleaves at the sn-1 position of the backbone, phospholipase A2 cleaves at the sn-2 position, phospholipase B cleaves at both the sn-1 and sn-2 position, phospholipase C (PLC) cleaves between the glycerol backbone and the phosphate, and phospholipase D (PLD) cleaves between the phosphate and the polar head alcohol (Fig. 1). Phospholipases C and D are phosphodiesterases. As indicated in Fig. 1, cleavage by PLC results in release of diacylglycerol and a water-soluble phospo-alcohol ester; cleavage by PLD results in release of phosphatidic acid and the head group alcohol, which may be ethanolamine, choline, serine, inositol, or other small primary alcohols. Among the bacterial phospholipases, there are zinc-metallophospholipases, which have broad specificity, sphingomyelinases, and enzymes that are specific for phosphatidylinositol, some of which are active on glycosylphosphatidylinositol (GPI)-anchored proteins. The thermodynamics, membrane insertion mechanisms, and significance of hydrophobic and electrostatic interactions of these enzymes with their membrane targets have recently been reviewed (Roberts et al. 2018). These will be discussed in the context of individual bacterial pathogens. Clostridium perfringens, a Gram-positive, spore-forming, anaerobic bacterium, is widely present in nature including decaying vegetation, soil, and in animal intestinal tracts. It is the cause of a common form of food poisoning, which is caused by an enterotoxin. Infections by C. perfringens are characterized by myonecrosis, intravascular leukocyte accumulation, and thrombosis. Among a number of toxins, C. perfringens secretes a PLC (α-toxin, CpPLC), which preferentially cleaves phosphatidylcholine and sphingomyelin. It also hydrolyzes phosphatidylethanolamine, phosphatidylinositol, and phosphatidylglycerol (Urbina et al. 2011). The importance of CpPLC as a virulence factor was demonstrated by mutagenesis of its active site resulting in loss of ability to produce gas gangrene (myonecrosis) (Awad et al. 1995; O'brien and Melville 2004). Immunization with the C-terminal domain of CpPLC prevented lethal infection and restricted tissue injury (Stevens et al. 2004). In addition to α-toxin, C. perfringens secretes a pore-forming toxin, perfringolysin O (PFO). Escape of C. perfringens from the phagosomes of macrophage-like J774–33 cells and mouse peritoneal macrophages was mediated by either PFO or CpPLC (O’Brien and Melville 2004). The multiple roles of CpPLC in the pathogenesis of gas gangrene have been reviewed (Flores-Diaz and Alape-Giron 2003), and the multifarious effects of CpPLC on cells and tissues have been recently summarized (Flores-Diaz et al. 2016). Several of these effects can be attributed to the activation of host PKC through the formation of diacylglycerol, a lipid second messenger, by direct action on host membranes, or through activation of endogenous PLC through a pertussis toxin-sensitive GTP-binding protein, resulting in stimulation of rabbit neutrophil adhesion (Ochi et al. 2002). Alpha-toxin causes cell death in many cell types with enhanced toxicity for cells deficient in gangliosides (Flores-Diaz et al. 2005). At sublytic concentrations, α-toxin is internalized and activates the MEK1/2, Erk 1/2, and NF-κB pathways resulting in the production of reactive oxygen species (ROS) and cell death (Monturiol-Gross et al. 2014). Gas gangrene is characterized by accumulation of neutrophils of the vascular endothelium at the margins of necrosis. Activation of the ERK1/2/NF-κB and the p38 MAPK pathways induces release of IL-8, which activates migration and binding of neutrophils (Oda et al. 2012b). Recombinant CpPLC induced platelet aggregation, resulting in thrombosis and decreased blood flow (Bryant et al. 2000). Alpha-toxin was also found to inhibit erythroid differentiation in mouse bone marrow cells. The differentiation of human K562 erythroleukemia cells was negatively affected by CpPLC (Takagishi et al. 2017). In general, these findings are consistent with a model in which the activity of CpPLC is not confined to simple host cell cytolysis. Many of its effects are related to its engagement with various host signaling pathways. L. monocytogenes (Lm), a Gram-positive, rod-shaped bacterium, is the cause of a potentially fatal food-borne infection which predominantly affects immunocompromised individuals. Among this group, pregnant women and the elderly are frequent targets (Lorber 2007; Radoshevich and Cossart 2018). It enters the blood stream through the intestinal epithelium and lymph nodes and then invades target organs such as the liver, spleen, and the brain stem. In tissues, it can enter non-phagocytic cells using Internalin A (InlA) and Internalin B (InlB), surface proteins which bind to cell membrane receptors E-cadherin and Met, the receptor for hepatocyte growth factor, thus promoting internalization. Lm then enters a phagocytic vacuole from which it is able to escape within minutes (Gaillard et al. 1987; Tilney and Portnoy 1989; Goldfine and Marquis 2007). Three major virulence factors play a role in this process. Listeriolysin O (LLO), a cholesterol-dependent pore-forming hemolysin, is essential for escape (Gaillard et al. 1986; Kathariou et al. 1987; Portnoy et al. 1988). 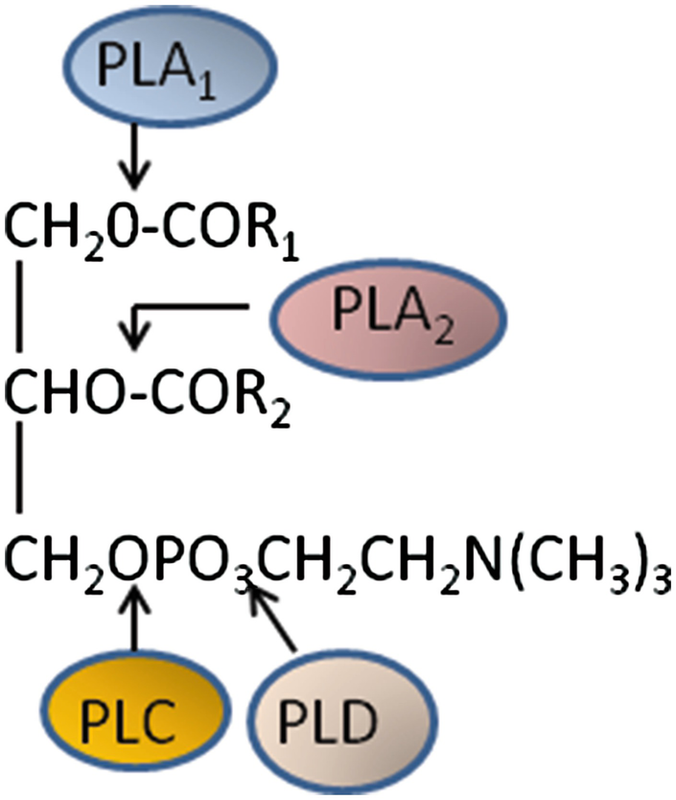 Two phospholipases, a phosphatidylinositol-specific phospholipase C (PI-PLC, PlcA) (Mengaud et al. 1991a; Leimeister-Wächter et al. 1991; Camilli et al. 1991) and a broad-range Zn2+ metallophospholipase C/sphingomyelinase (PC-PLC, PlcB) (Geoffroy et al. 1991; Smith et al. 1995; Zückert et al. 1998), facilitate escape, but their roles are cell-type dependent. In professional macrophages, a deletion in plcA, results in a reduction of approximately 40% in the number of bacteria that are released into the cytosol. Deletion of plcB did not affect escape in these cells (Camilli et al. 1993; Smith et al. 1995). In Henle 407 human epithelial cells, the broad-range PLC is able to promote escape from the primary vacuole in the absence of LLO (Marquis et al. 1995) (Fig. 2). The genes for LLO, PlcA, and PlcB are in a single regulon under the positive control of PrfA (Leimeister-Wächter et al. 1990; Mengaud et al. 1991b; Freitag et al. 1993; Miner et al. 2007). Deletion of plcA resulted in a small increase in mouse LD50, and deletion of plcB led to an approximately 20-fold increase; however, deletion of both phospholipase genes led to an increase of approximately 500-fold increase in mouse LD50, a clear indication of overlapping roles for these phospholipases in this murine model of infection (Smith et al. 1995). In a murine cerebral listeriosis model, deletion of plcB leads to reduced virulence. There was delayed intracerebral spread of the ΔplcB mutant strain, indicating that cell-to-cell spread is an important factor in listerial brain infections (Schlüter et al. 1998). When Lm moves from cell to cell, it becomes encased in a double-membrane vacuole (Fig. 2). It has been proposed that activity of the two phospholipases is needed for the dissolution of the inner membrane of the double-membrane vacuole, and the activity of LLO is required for disruption of the outer membrane (Alberti-Segui et al. 2007). Immediately downstream from hly, the gene for LLO in the Lm chromosome, is mpl, encoding a zinc-dependent metalloprotease (Mpl). This protein is needed for processing of the secreted inactive form of PC-PLC to form the mature active form (Poyart et al. 1993). Upon cell-cell spread, decreased vacuolar pH leads to Mpl activation of proPC-PLC, resulting in bacterial release of active PC-PLC (Marquis and Hager 2000). Mpl maturation is similarly pH-sensitive (Forster et al. 2011). pH regulates translocation of PC-PLC across the cell wall, and this process is also pH-sensitive (Yeung et al. 2005, 2007). The activity of recombinant PlcB is also pH-sensitive with optimal activity below pH 7.0 (Huang et al. 2016). Compartmentalization of PlcB activity achieved by making its activation and translocation optimal at reduced pH is critical for Lm virulence suggesting that unregulated activity of this broad-range PLC can be harmful to the host cell (Yeung et al. 2007). PlcA was identified based on its homology to previously studied PI-PLCs from Bacillus cereus and Bacillus thuringiensis (Mengaud et al. 1991a; Camilli et al. 1991; Leimeister-WÄchter et al. 1991). The Lm protein, like the classical PI-PLC from B. cereus, has a modified TIM barrel structure with a distorted (β8α6) fold (Heinz et al. 1996; Moser et al. 1997; Roberts et al. 2018). It is highly specific for phosphatidylinositol (PI) and does not cleave phosphorylated forms of PI (PI-4-P, PI-4,5-bisphosphate) (Goldfine and Knob 1992). Unlike the previously discovered PI-PLCs of B. cereus, B. thuringiensis, and Staphylococcus aureus, it displays very low activity on glycosyl-PI-anchored membrane proteins (Gandhi et al. 1993; Wei et al. 2005b). LmPI-PLC exerts its effect prior to entry of bacteria into J774 macrophage-like cells. Elevation of intracellular calcium and activation of PKCδ occur before entry, and these consequences of PI-PLC activity decrease the rate of entry of bacteria. LLO is required for PI-PLC-dependent intracellular signaling (Wadsworth and Goldfine 1999, 2002). Once the bacteria are internalized and contained within the primary phagocytic vacuole, LmPI-PLC encounters the lipids of the external leaflet of the plasma membrane, phosphatidylcholine (PC), and sphingomyelin, for which it has little affinity. 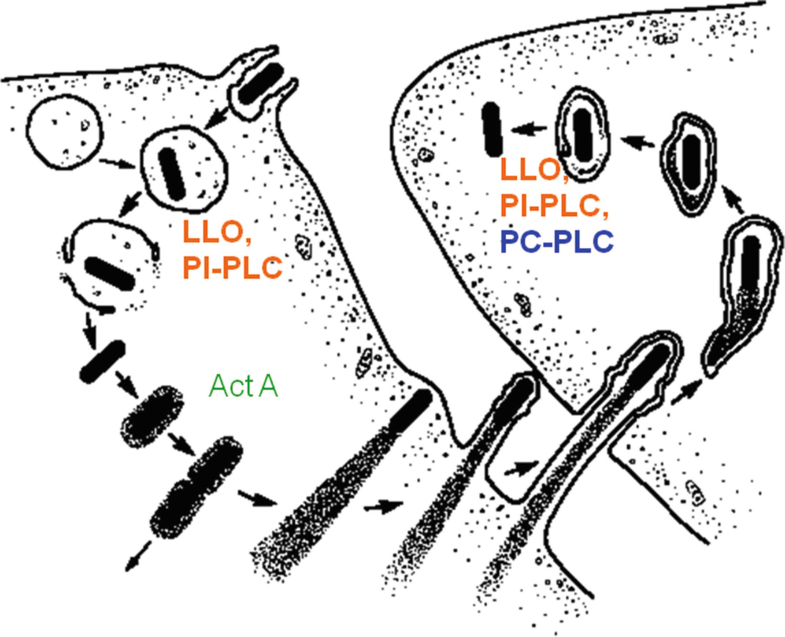 The formation of pores at reduced pH in the acidified phagosome by LLO presumably permits PlcA to enter the cytosol where it rapidly finds negatively charged lipids in the inner leaflet of the plasma membrane. The high ionic strength of the cytosol activates PlcA for its activity on PI (Chen et al. 2009; Goldfine and Knob 1992). The minimal activity of LmPI-PLC on GPI-anchored proteins is ascribed to the absence of a small beta-strand (Vb), which is present in B. cereus PI-PLC (BcPI-PLC) and is absent in the enzyme from Lm. The Vb beta-strand in BcPI-PLC forms contacts with the glycan linker of GPI anchors, which presumably increases its activity on GPI-anchored proteins. Deletion of the Vb beta-strand from BcPI-PLC resulted in weakened activity on GPI-anchored proteins and improved the efficacy of BcPI-PLC in promoting escape of Lm from the phagocytic vacuole and increased the virulence of Lm with this modified BcPI-PLC compared to that of Lm expressing intact BcPI-PLC (Wei et al. 2005b). Cleavage of PI leads to the formation of diacylglycerol (DAG) a lipid second messenger. Human neutrophils are activated by LLO and LmPI-PLC. Phosphoinositide hydrolysis and the respiratory burst were provoked by a recombinant Listeria innocua strain producing LmPI-PLC (Sibelius et al. 1999; Lam et al. 2011). In addition to DAG, the action of Lm PlcB on sphingomyelin produces ceramide which acts as a second messenger leading to persistent NF-kappa B activation, increased expression of E-selectin, and increased rolling/adhesion of polymorphonuclear leukocytes (PMN) (Schwarzer et al. 1998). The application of LLO and LmPI-PLC to human endothelial cells resulted in phosphatidylinositol hydrolysis and the generation of diacylglycerol (Sibelius et al. 1996). As noted above, within minutes of addition of wild-type Lm to J774 macrophage-like cells, a series of calcium elevations occurs at the same time as activation of PKC δ and PKC β. These signals are dependent on the presence of LLO and PI-PLC. LLO and PlcB synergize to induce surface expression of FasL on T cells. Calcium elevation appears to be needed for FasL upregulation (Zenewicz et al. 2004). When mouse bone marrow-derived macrophages with a deletion in PKC β were infected with Lm, the escape of bacteria from the primary phagosome occurs, but it no longer dependent on the action of PlcA (PI-PLC). In these cells, escape is diminished in the absence of PlcB, which has no effect on escape in wild-type bone marrow-derived macrophages (Poussin et al. 2009). These results support the concept that the effects of LmPI-PLC on the ability of Lm to survive and grow in the macrophage are dependent on host PKC β. When PI-PLC from Lm is replaced with that from B. cereus, which binds to and cleaves GPI-anchored proteins, escape from the primary phagocytic vacuole of macrophages cells is similar to that shown by Lm with a deletion in plcA (Wei et al. 2005b). Lm spreads from cell to cell by means of host-derived actin-based motility. Actin-based propulsion produces protrusions from the infected cell’s plasma membrane which are engulfed by neighboring cells (Tilney and Portnoy 1989) (Fig. 2). In the newly infected cell, Lm is surrounded by a double-membrane vacuole. The inner monolayer of the membrane closest to the bacterium is derived from that of the plasma membrane. It contains phosphatidylethanolamine, phosphatidylserine, and PI. PlcA thus finds its substrate and can release DAG once the double membrane is lysed by PlcB and other players including LLO (Alberti-Segui et al. 2007). Intracellular bacteria can be targeted by the autophagy machinery while in phagocytic vacuoles or free in the cytosol (Deretic et al. 2013; Rich et al. 2003). Lm PLCs were implicated in autophagy evasion in fibroblasts (Py et al. 2007) After escape from the primary vacuole of macrophages, Lm is targeted by the autophagic machinery, which is present in several forms. There is increasing evidence that the phospholipases C, especially PlcA, along with ActA are involved in avoidance of autophagy in macrophages. Autophagy requires phosphatidylinositol 3-phosphate (PI3P), and one mechanism by which PlcA assists in resistance of Lm to autophagy is through the reduction of membrane PI, a needed substrate for PI3P formation, thus inhibiting the maturation of preautophagosomal structures (Tattoli et al. 2013; Birmingham et al. 2007, 2008; Mitchell et al. 2015). Avoidance of autophagy mediated by PlcA and ActA is required for the growth of Lm in macrophages. It appears that xenophagy was needed to impede the growth of Lm and that the PLCs were involved in avoidance of this macroautophagic process (Mitchell et al. 2018) (Fig. 3). In addition to orthologs of LmPI-PLC and the broad-range PLC (PlcB), Listeria ivanovii, a ruminant pathogen, produces a specific sphingomyelinase (SmcL) (Gonzalez-Zorn et al. 2000). It is of interest that this organism displays tropism for ruminants and that ruminant red blood cells are characterized by the presence of high concentrations of sphingomyelin. If this is also true of the cell membranes and phagocytic vacuoles of other ruminant cell types, the production of this extra phospholipase with specificity for sphingomyelin may be important for the ability of L. ivanovii to infect these animals (Vázquez-Boland et al. 2001). The role of SmcL in virulence was explored by gene disruption. These experiments confirmed a need for sphingomyelinase in disruption of the primary phagosome in the bovine epithelial-like MDBK and J774 macrophage-like cell lines. Furthermore, the LD50 of the mutant strain was four times higher than that of wild-type L. ivanovii in a murine model of infection (Gonzalez-Zorn et al. 2000). Three species of Bacillus, Bacillus anthracis, Bacillus cereus, and Bacillus thuringiensis, are closely related. Each has a PI-specific PLC, which is active on PI- and GPI-anchored proteins, a PC-PLC with activities on a broad spectrum of glycerol-phospholipids, and a sphingomyelinase. The PI-PLCs of these three species have >94% amino acid identity (Read et al. 2003; Volwerk et al. 1989). The ability of B. cereus PI-PLC (BcPI-PLC) to release alkaline phosphatase from tissues was central to the discovery of GPI-anchored proteins (Ikezawa et al. 1976; Low and Finean 1977). B. cereus is an opportunistic pathogen, and secretion of PI-PLC appears to be important in its ability to cause disease (Callegan et al. 2002a, b). B. cereus SMase also contributes to its virulence. When the gene for BcSMase was inserted into a strain without this gene, the transformant grew in vivo in a mouse infection, whereas a transformant carrying a gene for an inactive enzyme did not grow in mice. When treated with BcSMase, mouse macrophages produced less H2O2 in response to activation by peptidoglycan (Oda et al. 2012a, 2014). B. anthracis, the causative agent of anthrax, can infect through the skin or by inhalation of spores from infected animals. The resulting septicemia leads to production of a lethal toxin. B. anthracis secretes a PI-PLC, a PC-PLC, and a sphingomyelinase, which are induced under anaerobic conditions (Klichko et al. 2003). The importance these phospholipases for B. anthracis infectivity was tested in a murine model of inhalation anthrax. Deletion of any one of the three phospholipases had essentially no effect on infectivity. Deletion of all three resulted in attenuation of virulence for mice. The PLC-null strain was unable to grow in association with macrophages (Heffernan et al. 2006). B. anthracis expresses a pore-forming cholesterol-dependent cytolysin, anthrolysin O (ALO) (Shannon et al. 2003). Deletion of ALO alone had no effect on the virulence of B. anthracis for mice. However, combinations of ALO deletion with deletions of one or more of the PLCs resulted in reduced virulence in both tissue cultures and in mice, indicating that these toxins have overlapping roles in the pathogenesis of B. anthracis (Heffernan et al. 2007). The ability of B. anthracis PI-PLC to cleave GPI-anchored proteins has been implicated in down-modulation of the immune response, thus allowing this pathogen to survive in the mammalian host. Treatment of murine dendritic cells with Bacillus, but not Listeria PI-PLC, which has very low activity on GPI-anchored proteins, inhibited the activation of dendritic cells by Toll-like receptor (TLR) ligands. In addition, infection of mice with Lm expressing B. anthracis PI-PLC resulted in reduced antigen-specific CD4 T cell response. These data indicate that B. anthracis PI-PLC down-modulates DC function and T cell responses, mediated by cleavage of GPI-anchored proteins which are important for DC activation through TLR (Zenewicz et al. 2005). Since many immune receptors are GPI-anchored proteins, there are likely to be other examples of such downregulation of innate immunity (Roberts et al. 2018). When B. anthracis PI-PLC was expressed in L. monocytogenes in place of LmPI-PLC, the ability of the hybrid strain to escape from the primary vacuole was greatly reduced compared to wild-type L. monocytogenes, and the ability to spread from cell to cell, which requires escape from the secondary double-membrane vacuole, was also diminished. The cytotoxicity of a L. monocytogenes strain expressing both ALO and BaPI-PLC was less than that of the strain expressing both ALO and LmPI-PLC. These toxins appear to have coevolved to protect the host cell while promoting growth of each pathogen (Wei et al. 2005a). The β-toxin of Staphylococcus aureus, encoded by hlb, is a sphingomyelinase toxic to human keratinocytes (Huseby et al. 2007), which inhibits interleukin-8 expression, thus decreasing the transendothelial migration of neutrophils (Tajima et al. 2009) and contributing to escape from the phagosome of human epithelial and endothelial cells (Giese et al. 2011). It strongly stimulates biofilm formation in a rabbit model of endocarditis presumably through forming covalent cross-links in the presence of DNA independent of its sphingomyelinase activity (Huseby et al. 2010). Tuberculosis is one of the leading causes of disease caused by infectious organisms resulting in approximately 1.7 million deaths annually. The World Health Organization estimates that 558,000 people are infected with multidrug resistant Mycobacterium tuberculosis (Mtb). It is a leading cause of death among those infected with HIV. The lipases of Mtb belong to the alpha/beta hydrolase fold superfamily (Johnson 2017). Of these homologs, the Mtb genome contains at least two genes encoding PLA2. One of these, encoded by cut4, is cytotoxic to macrophages (Schue et al. 2010; Dedieu et al. 2013). Orthologous genes are found in several virulent mycobacteria (Dedieu et al. 2013). These findings suggest, but do not conclusively show, that Cut4 plays a role in Mtb infectivity. Remarkably some M. tuberculosis isolates can carry as many as four genes (plcABCD) encoding significantly homologous proteins with PLC/SM activity. All these genes encode orthologs of the PlcH and PlcN of P. aeruginosa (Stonehouse et al. 2002), despite the fact that M. tuberculosis is very distantly related to P. aeruginosa which is a gram-negative bacterium. Phospholipase C (PLC) and sphingomyelinase (SM) activities were found to be associated with the most virulent species of mycobacteria (Johansen et al. 1996). Moreover, triple and quadruple mutants of M. tuberculosis examined in a mouse infection model revealed that both mutants were attenuated compared to the wild-type parent in the late phase of infection (Raynaud et al. 2002). Finally, with regard to the functional similarities between the PLC/SM of M. tuberculosis and P. aeruginosa, recent studies showed that the expression of PlcABCDs of M. tuberculosis and the expression of PlcH and PlcN of P. aeruginosa are strongly upregulated under phosphate limitation and that the PLC/SM-proficient M. tuberculosis strains survived better than the PLC/SM deletion mutants under conditions where phosphatidylcholine served as a sole phosphate source (Le Chevalier et al. 2015). This is of possible importance since there are significant amounts of phosphatidylcholine in lung surfactant. These observations open new perspectives for the further role of the PlcABCDs in the lifecycle of M. tuberculosis. The last four decades have produced a remarkable body of work describing the pathogenesis of bacterial infections and the virulence factors that promote and participate in the infectious process. Exploration of bacterial genomes aided by improved methods for sequencing DNA has greatly expanded the identification and understanding of the roles of lipases, phospholipases, and sphingomyelinases in promoting the ability of bacteria to colonize and damage host tissues. As described in this chapter, many of these actions do not arise from simple destruction of host cell membranes and organelles. Rather, deeper explorations show that downstream effects are often caused by the production of lipid second messengers such as diacylglycerol and ceramide. Diacylglycerol activates many members of the PKC family. However, the trail often ends when the targets of these kinases remain unknown. The study of bacterial infections has revealed many previously unknown details of eukaryotic cell biology. For example, description of the cellular participants and mechanisms of autophagy have been elaborated through the study of intracellular bacteria. As discussed above, there is a clear distinction between PI-PLCs that interact with the outer surface of cells and cleave GPI-anchored proteins (B. cereus, B. anthracis, B. thuringiensis, and S. aureus) and that from L. monocytogenes, which has little or no activity on GPI-anchored proteins. Its sole substrate appears to be PI, since it does not cleave phosphorylated forms of PI. Many of the GPI-anchored protein targets of the enzymes of B. cereus such as alkaline phosphatase, erythrocyte acetylcholinesterase, 5′-nucleotidase, scrapie prion protein, CD59, and Thy-1 are well known (Paulick and Bertozzi 2008), but the link between cleavage of these and the many other GPI-anchored proteins of mammalian cells and downregulation of innate immunity needs much more study. Continued study of bacterial lipases, phospholipases, and sphingomyelinases should prove rewarding in deciphering the intricate networks of lipid messengers, proteins, and protein complexes that either protect cells from infection or promote the infectious process.